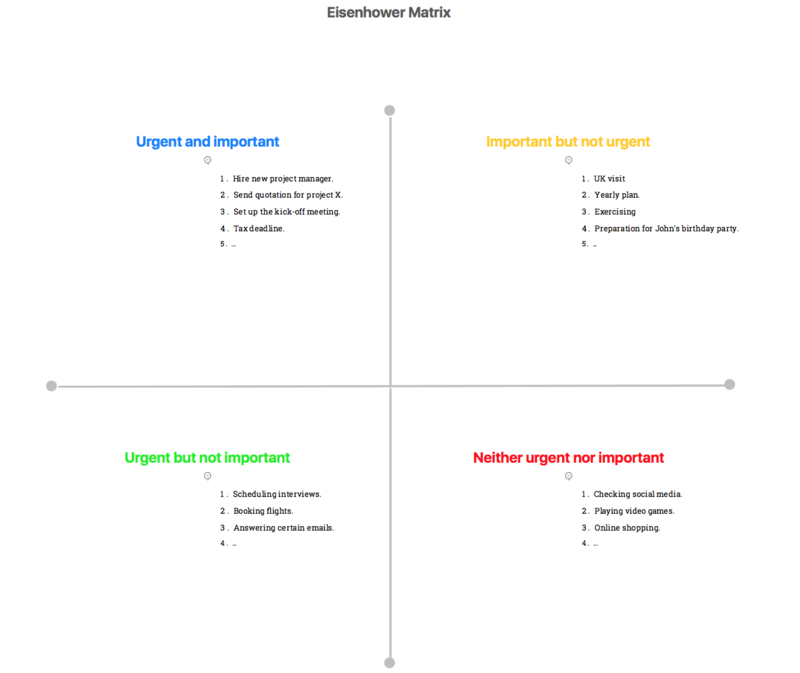 XMind Blog: How to use Eisenhower matrix to manage your tasks? How to use Eisenhower matrix to manage your tasks? Do you sometimes find yourself overwhelmed by the growing list of things you need to get done? In today’s hectic world, we all have a lot of works and tasks that need to be done every day. Effective task management helps us get more done in less time and boost our productivity. So, if you have a lot of tasks to be done in the same time, how do you manage or plan them? Which task should you do first? To help manage your tasks effectively, the Eisenhower Matrix can be a powerful tool. The Eisenhower Matrix, which is also known as the Urgent-Important Matrix, is a powerful way of thinking about priorities. It helps you prioritize your tasks based upon their urgency and importance, and also allows you to identify tasks that you should either delegate or leave undone. With just a simple click you can open a blank mind map with the matrix diagram in XMind. The relationship line helps you to divide the map into four quadrants: Quadrant 1 (Urgent and important), Quadrant 2 (Important but not urgent), Quadrant 3 (Urgent but not important) and Quadrant (Neither urgent nor important). If you have trouble differentiating between urgent and important tasks, keep in mind that urgent tasks demand your immediate attention; important tasks contribute to your long-term goals or values. Based on your own answer, yes or no, simply put the task where it should be. What to do with each quadrant? Quadrant 1 contains tasks that are both urgent and important, so do it now and do it yourself. These tasks are critical for your life and career and need to be done as soon as possible to avoid negative consequences. The tasks in quadrant 2 are important, but not urgent. For those tasks, where you should invest the majority of your time, you need to set the date, but you can push them for later. Please note that just because these tasks are not urgent does not mean that they are not important. Anything that will be beneficial to you in the long term will fall into the second quadrant. For quadrant 3 tasks, it is important to learn and remember how to delegate certain things. It may seem urgent at the time while it is happening, but these little things can be handled by other people. So you can focus on the urgent and important tasks. The tasks in quadrant 4 are simply time-wasters. If you are able to identify and eliminate all of your quadrant 4 tasks, you will free up some much-needed time to invest in your quadrant 2 tasks. 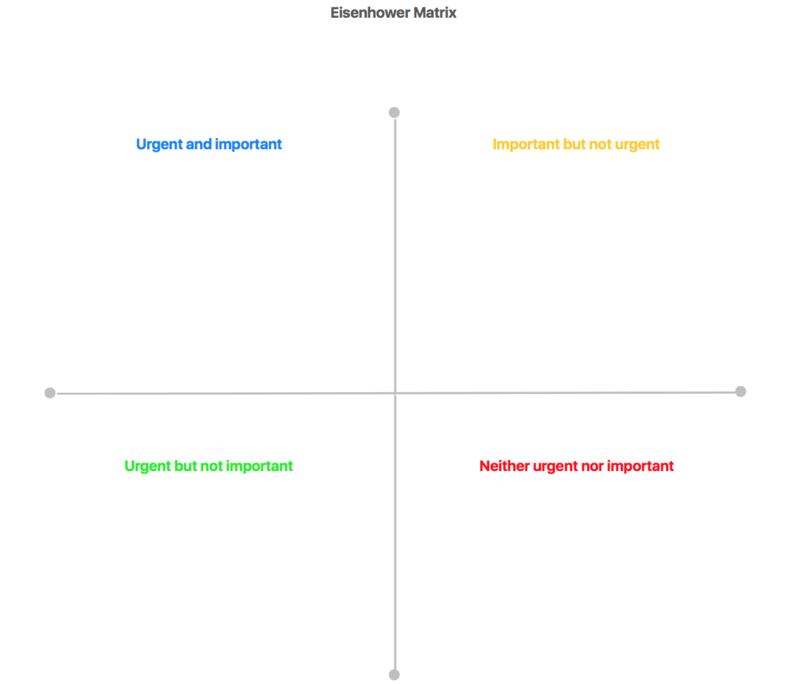 The Eisenhower Matrix is a simple and quick way to help you detect your priorities and the time wasters. If you used to have days when you were extremely busy but felt done nothing by the end of the day, then the Eisenhower Matrix is a powerful and useful tool to help eliminate this sort of situation. I really struggle with how to use the matrix option effectively. It’s just not very intuitive to me so I really appreciate posts about how to use that format! Thanks! Dear XMind team. Awesome advice as usual. I really like the fact that you always explain every map and how it should be used. Very professional blog. Thanks. Read this article to learn how to be more productive by using the same strategy that US President Dwight Eisenhower used to master his life and work.